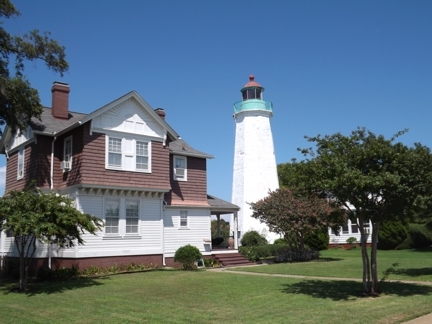 Old Point Comfort – Chesapeake Chapter U.S.L.H.S. This light is the second oldest lighthouse on the Chesapeake Bay. It was first lit in 1802 on the grounds of Fort George, the fort that was there prior to the current Fort Monroe. The 54 foot tall light was built by Elzy Burroughs who also built the New Point Comfort light located up the Bay. The stone steps lead up to the lantern room where the reflector lamp system was installed. During the War of 1812 the British captured the fort and the lighthouse and used them as an observation post. In 1855 a fog bell was added to the station. In 1891 a new keeper’s dwelling was built to replace the house that was built in 1823. In this time frame the reflector lamp system was replaced with a 4th order Fresnel lens. The station and the light were automated in 1973. The keeper’s quarters are now used as Army housing according to the sign in the front yard. 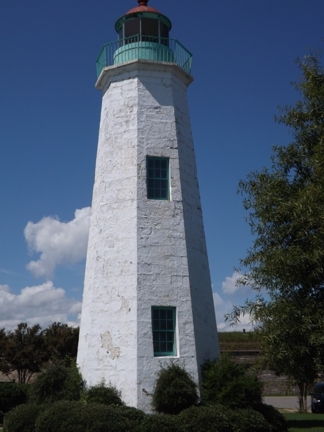 The light is listed as a Virginia National Landmark. The tower and keeper’s quarters are in excellent condition. There is ample parking in front of the light and outstanding photo opportunities in the area. Photos taken August, 2012 by A. Pasek.